Paragon Migrate OS to SSD is a new software helps to perform fast and safe Windows migrations to new storage devices (HDD or SSD) and even downsizes to smaller capacity drives in one simple step, thanks to advanced new data exclusion capabilities. So you are able to transfer a live Windows system (any version since XP) with no impact to your work when you want to upgrade your PCs to a speedy new Solid-State Drives (SSD) or when you buy a bigger hard drive and want to transfer all your contents to the newer one. Moreover, with the support of the uEFI/GPT configurations, you don’t have to bother about any boot issues. Paragon Migrate OS to SSD is very easy to use thanks to the handy intuitive wizard called Migrate OS to SSD. At launch, the wizard detects all existing Windows operating systems. Users then specify which OS they want to migrate. The wizard then automatically picks one or two partitions (Windows 7 may have Microsoft System Reserved, a special hidden partition that contains critical boot files) and prompts the user to select a destination disk. If the selected disk is big enough to hold the operating system, it starts the migration. If not, it asks the user to exclude data by unchecking boxes next to unnecessary files or folders. When the proper size is reached, the migration begins. Benefits of Paragon Migrate OS to SSD 3.0? Support of the restart-free installation. 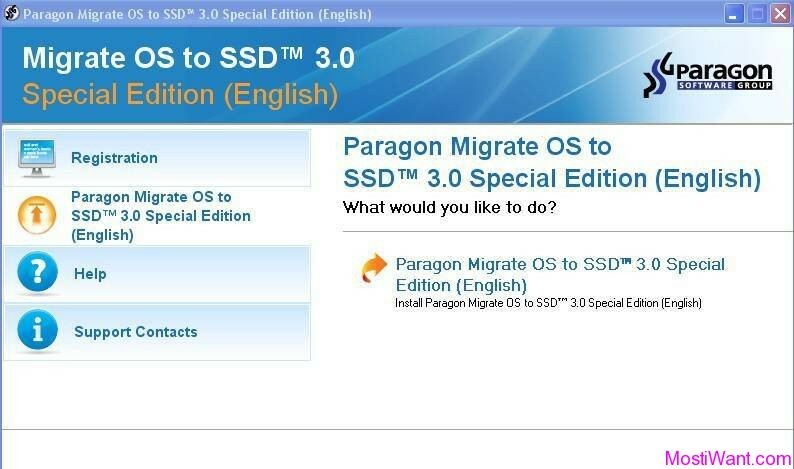 Paragon Migrate OS to SSD 3.0 is normally priced at $19.95 per serial number / product key, but you can download Paragon Migrate OS to SSD 3.0 Special Edition (English Version) free and legal from Giveaway of the Day for today only ( May 15, 2013). Don’t miss it. Visit GOTD Page. Limitations: Note! This giveaway version doesn’t include WinPE bootable media required for migration of a 64-bit Windows 7 or later configured to the UEFI boot mode. If you have a previous version of Paragon Migrate OS to SSD you should first uninstall it via Control Panel >> Add or Remove Programs. Then make sure to follow the instructions in the readme.txt file which is included in the package for proper activation. You have to install and activate it before the Giveaway offer for the software is over. Just in case here’s the registration link (though it will open from the program just fine). Fill in online registration form. Paragon will send you free product key and serial number within several minutes. If you do not receive the license email, please check your spam, bulk or junk mail folders.